Highly acclaimed London quartet The King’s Parade have revealed the video for their latest single ‘Woman’, which takes aim at the issues of gender inequality prevalent in today’s society. Featuring a lone female amongst a sea of larger, anonymous figures in New York, the video highlights the negative attitudes and behaviour towards women. Increasingly shunned and alienated from these more powerful figures, the monochrome aesthetic is broken only by the emergence of a flower, which engulfs the building, before the character blossoms into a soaring creature. 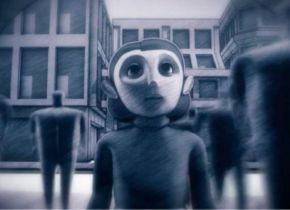 Deeply symbolic of patriarchal oppression and how it can be overcome, the video was animated by Lily Fang, who previously made the band’s video for their highly acclaimed single ‘Bunched Up Letters’. ‘Woman’ follows the release of the Haze EP last year which saw the band receive high profile support from BBC 6Music, BBC Introducing, The Independent, Wonderland, Alternative Press, EARMILK and many more. Its release saw them appear at summer festivals including Secret Garden Party and Cornbury Festival while they played sold out headline shows across the UK and Europe. Most recently The King’s Parade sold out their London release show for ‘Woman’ as well as being nominated for the UMA Choice Award at the forthcoming Unsigned Music Awards 2018. The King’s Parade breathe fresh life into UK guitar bands. They have developed an exciting new blueprint, which is seeing a loyal and expectant fanbase grow by the day.